During the last 10 years, Bangkok has transformed its mass transit system. Transportation within the capital of Thailand has improved immensely. When travelling in and around Bangkok, you can make use of the BTS Skytrain, MRT transport system, taxis and even Tuk Tuks. The government has poured investment into the various transportation systems. Many areas of Bangkok are now accessible that were previously not. This has not only improved transport, but it has also promoted property development and improved business opportunities. The latest transport improvements in Bangkok involve creating four outstanding new MRT stations. These stations will be like nothing else in the country. They will be considered works of art and will be both beautiful and functional. The stations are located at Wat Mangkorn, Samyod, Sanam Chai and Isaraphap. In this article, we look at other beautiful examples of underground stations, and what we can expect from the new MRT developments. If you search Google for any of these stations, you will be amazed at their design and style. Komsomolskaya in Moscow, for example, looks more like a royal palace than a metro station – lined with decadent stucco plasterwork and opulent chandeliers. The Thai government aims to rival these well-known wonders and put their own MRT stations on the global map with these four new artistic additions. Wat Mangkorn is part of the MRT Blue Line extension and is located close to Bangkok’s Chinatown. It is the next station in line after Hua Lamphong and is set for completion later this year. As you would expect from a station located near Chinatown, this new structure will have a distinctly Chinese style. 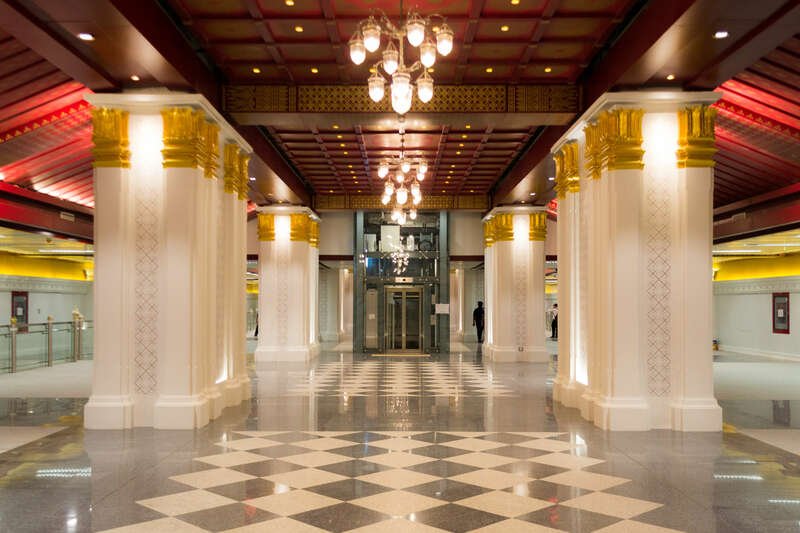 You can expect to see Chinese dragon motifs, intricate floral patterns and bold columns of red and gold. Furthermore, the main staircase leading into the station will resemble the scales and underbelly of a dragon. This is certainly one of the boldest new station designs and should fit perfectly with the surrounding mix of Thai and Chinese heritage in the area. Sam Yod station will sit in-between Wat Mangkorn and Sanam Chai and will feature stunning architecture reminiscent of the famous Samyod Arch and the old government buildings on Charoen Krunh Road. This station will actually feature two layers of track and an exterior lavished with colonial style architecture. Furthermore, the interior will feature historical photography showing different time periods within Thailand. Sanam Chai is possibly the most adventurous of the new MRT stations. It has actually been designed by renowned Thai architect and national artist Dr Pinyo Suwankiri. This station looks more like a Rattanakosin-era palace or stateroom rather than a place of public transportation. The main hallway will have a gorgeous red panelled ceiling complete with glistening chandeliers. 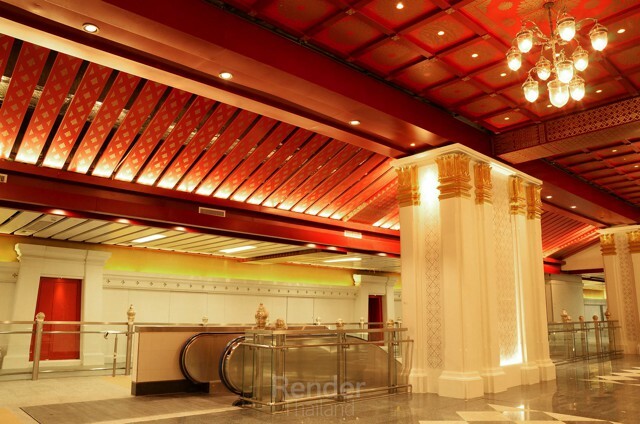 Supporting the ceiling, you can expect dazzling white columns adorned with intricate designs and golden fixtures. The whole interior looks opulent and magnificent. The exterior is just as interesting and will feature a traditional style facade and entrance gate. To top it off, this station will actually open out into the popular Museum Siam. Isaraphap will actually be the first Blue Line MRT station to sit in the Thonburi region of Bangkok. This should bring increased opportunities to the area. The main theme of this decadent station is the mythical golden swan – this pays homage to the sublime and honoured Wat Hong Rattanaram which is not far from the station. You can expect a myriad of gold furnishings and architectural features throughout the station. 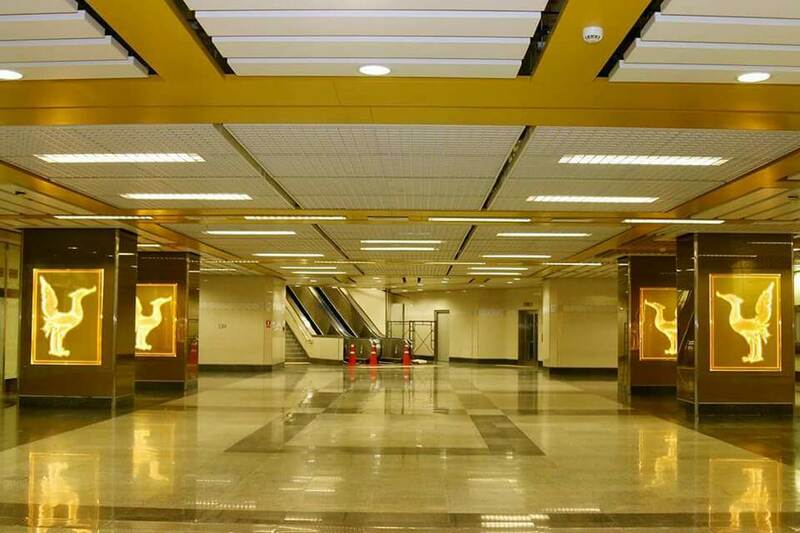 The columns and ceilings of the main terminal, for example, will be golden and contain swan iconography. We like the fact that each station will have a specific theme and style, that also reflects nearby landmarks and culture. We can’t wait to see these new MRT stations unveiled in all their glory – it should open a new chapter in the history of Bangkok’s mass transit system and open the doorway for future artistic license. Each of these stations will offer something different – a fantastic mix of style and tradition. They should help spread Thai culture, and hopefully, become a tourist attraction in their own right.